For this week’s Monochrome Madness, I’m featuring another shot from a recent visit to Seattle. The light was going down for the day, and the clouds were moving generally sideways to my composition. I shot this using the in-camera setting for stacking exposures, knowing this would accentuate the cloud movement. Leanne Cole hosts this weekly challenge, and you can see the monochrome work from other bloggers, as well as instructions on how to join in on her website. On a recent trip into Seattle, the pilot announced that we would be landing in overcast and light rain conditions. Either the weather changed very quickly or his updates were not recent. Low clouds with pockets of sunshine made for all kinds of great light on the Puget Sound and downtown Seattle. This is my contribution to this week’s Monochrome Madness hosted by Leanne Cole. The photos from other bloggers and instructions on how to participate can be found on her site. WordPress recently informed me that I have been on their site for a year now. To those of you who have followed, liked, commented or enjoyed my posts – Thank You! It was a little over a year ago when I was spending way too much time on a computer because a leg injury was keeping me inactive. Those who know me know I don’t do well at sitting. I came across a page that explained why photographers should start a blog and listed some sites. I really had no idea what I was getting into, but I have a lot of photographs that never made publication, and many that have a story behind them. I was always disappointed when I came across other photographer’s websites and saw interesting images that had no words to convey the thoughts, motivation or process behind the image. I suppose I should start with my title. Quite a few years ago, I had the chance to meet with Josef Muench. Josef was one of the pioneers of modern day landscape photography, and around that time an editor told me that Josef was still submitting photos to the magazine, some of which couldn’t be used because the emulsion had started to degrade. As I was talking with Josef, I asked him, “Out of all your photographs, which is your favorite?” He responded quickly with “The one I haven’t taken yet!” He was an inspiration with his images, but even more so with his philosophy. I want to reach that age and continue taking photographs that I still care about. That’s where the name Gottatakemorepix got its initiation. I had a couple stories that I wanted to write when I first started, but I wasn’t sure how long I would keep this going. Then I started noticing blog posts that all had the words “Weekly Photo Challenge” in the title, and soon began posting those. I’ve participated in other blogger’s challenges, and as much as I enjoy seeing what other people respond with, I never knew how time consuming this could become. I also noticed a lot of people posting “Wordless Wednesday”. After doing a couple of these myself, I thought I can’t do this…I need words. So my alternative is Mid-week Mixings. This allows me to get away with Tuesday, Wednesday, or Thursday, too! To those of you that post every day, my hat’s off to you – I don’t know how you do it. If you don’t see a post from me for a while, it’s a good bet that I’m travelling or just plain busy. My priorities are still real life, family, and friends before cyberspace. My end of December and beginning of January were way too busy to do a 2015 recap, so I’m going to do it here. Las Vegas Fireworks July 2015. Photo by Steve Bruno. The Atlantic Ocean in early morning. Photo by Steve Bruno. Sunset over Red Rock Canyon, Nevada. Photo by Steve Bruno. Aerial view over the Rocky Mountains. Photo by Steve Bruno. Sandstone cave in Valley of Fire State Park, Nevada. Photo by Steve Bruno. Pedestrian in the nighttime rain in Seattle. Photo by Steve Bruno. As I ventured around Seattle, I was fascinated with the patterns and textures of the buildings. Maybe that’s because I live in a city that lacks older genuine buildings. As with yesterday’s post, the lack of rain made all this possible. Light and shadow coming together. Court House building at night, downtown Seattle. Distorted reflections in downtown Seattle building. Squares and rectangles as far as one can see. Seattle Library, looking other direction, and right side up. The day before I headed off to Seattle, I checked the NWS forecast – Rain 100%, or Rain Likely every day. I didn’t think there would be much chance for photography, other than a few window seat shots (more on that to come). Oh, there was some rain, alright (see previous post), but there was much more time when it wasn’t raining. I think the biggest surprise was that there was plenty of autumn color still. Much of the country has seen the leaves all go away, and this is when the lowest deserts are starting to peak. Somehow Seattle, despite being this far north, and despite all the rain and wind, manages to hold on to autumn. Autumn afternoon view from airplane landing in Seattle. Photo by Steve Bruno. It was evident that I would have a reason to take my camera out before the plane even touched down. As soon as I was checked in, I grabbed my camera and started walking around. I saw a small group of trees amidst the tall buildings that were in various phases of changing color. I didn’t realize that I had stumbled upon Freeway Park. Appropriately named, the park sits above the freeway running through downtown Seattle. Many of the foliage shots I took were in this park. Walkway through Freeway Park, Seattle. Photo by Steve Bruno. Full range of autumn colors in Freeway Park, downtown Seattle. Photo by Steve Bruno. Fallen leaves mix with green vegetation in Freeway Park, Seattle. Photo by Steve Bruno. Autumn trees along city streets in downtown Seattle. Photo by Steve Bruno. Autumn leaves cover the ground while some trees still hold on to their color in Freeway Park, Seattle. Photo by Steve Bruno. Tree branches reach skyward with the remaining leaves of autumn in Freeway Park, Seattle. Photo by Steve Bruno. Most people think I’m crazy when I say I enjoy going to Seattle in November. And that’s before I tell them I also enjoy walking around in this weather. My attitude might be different if I spent months here, instead of just being a visitor. I grew up in the Midwest, and remember long periods of dismal weather, and from that experience, I also remembered how to dress appropriately. On this particular evening, I was walking around with just my phone in its Otterbox case. The rain was coming down at a substantial clip, even for Seattle. It rains much harder in the desert, but that’s usually for about five minutes. After I took the shot above, it occurred to me that I should head back to my hotel and grab my real camera. By the time I did, the rain had reduced to the standard drizzle. It never did rain again at night while I was here. Rainwater starts to collect along the streets of Seattle. Photo by Steve Bruno. For this week’s challenge, bridges seemed like an obvious choice to visualize connections. Burro Creek bridge, above, spans a pretty deep canyon, but you’d never know it by this shot. Winter morning fog was the remnant of a significant storm from the previous days, and made for a great morning photoshoot. A place renowned for its fog, San Francisco, is where you’ll find the Bay Bridge connecting that city to Oakland and points beyond. I had clear skies on my last visit there, allowing me to capture this panorama of the Bay Bridge. 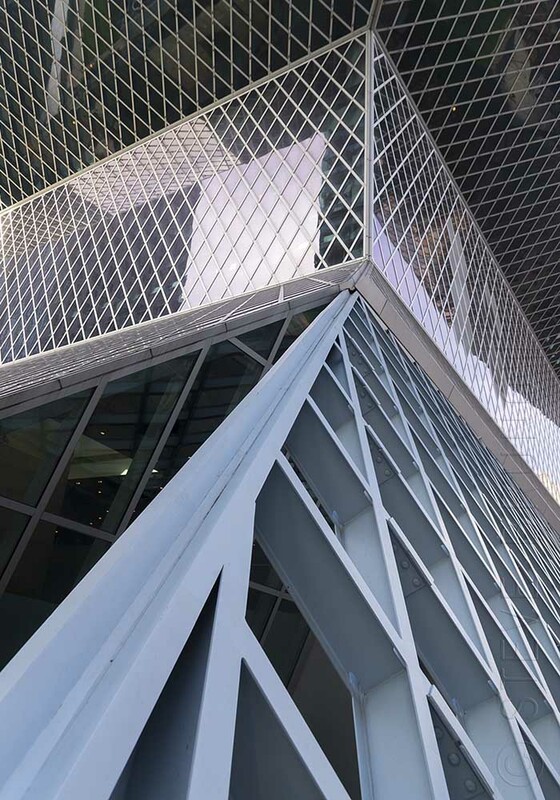 Another piece of architecture, the downtown Seattle library, looks as though it is three separate structures connected together. 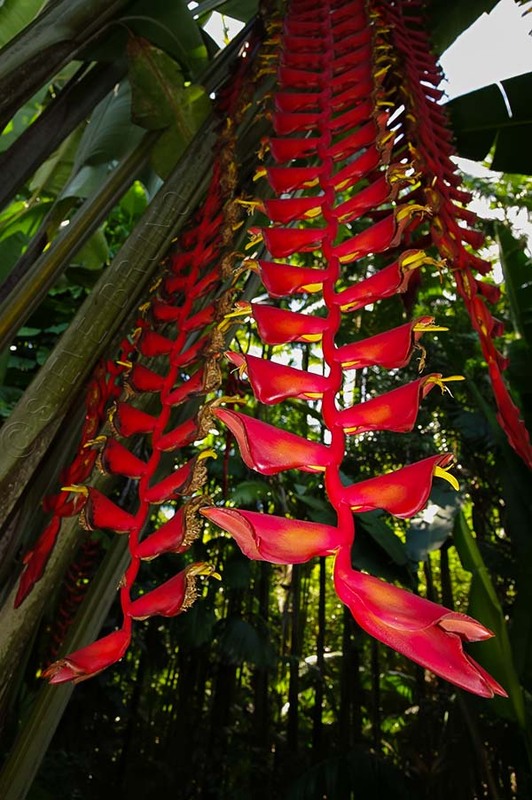 In nature, I came across these hanging flowers in a botanical garden in Hawaii. They appear to be connected by a long red rope. 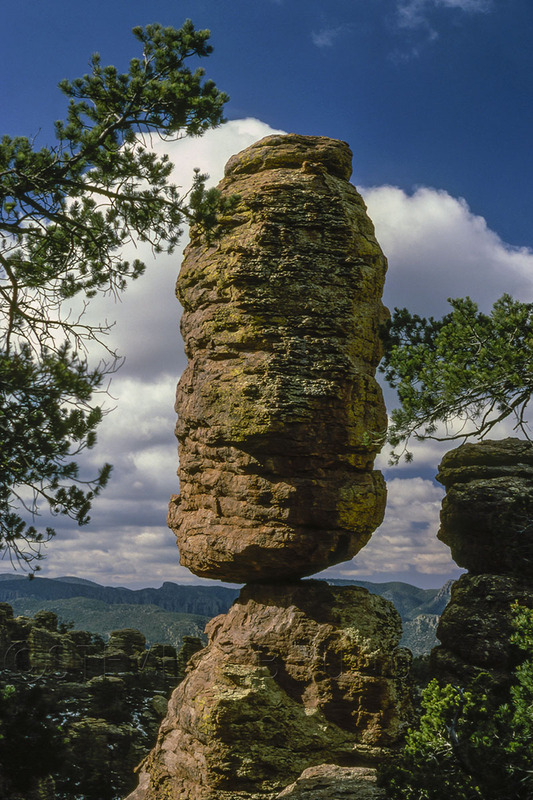 Also in nature, I visited Chiricahua National Monument in southern Arizona, home of the Pinnacle Balanced Rock. It’s a pretty amazing sight to see something of that size and weight connected to its base on that tiny spot. Lastly, the strongest connections you will ever encounter are the human kind. Emotional bonds are the source of many decisions we make in life, and not always for the best. 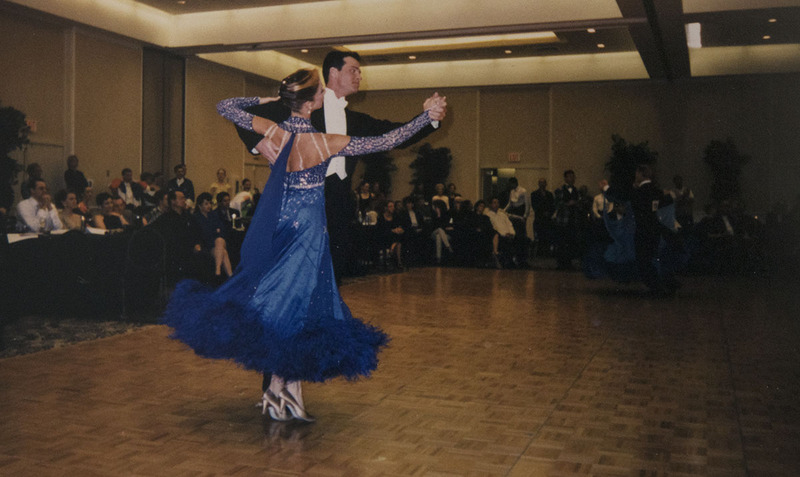 For an example of a physical connection, I have chosen this pair of ballroom dancers. In any type of partner dancing, nothing works if there is not a connection. 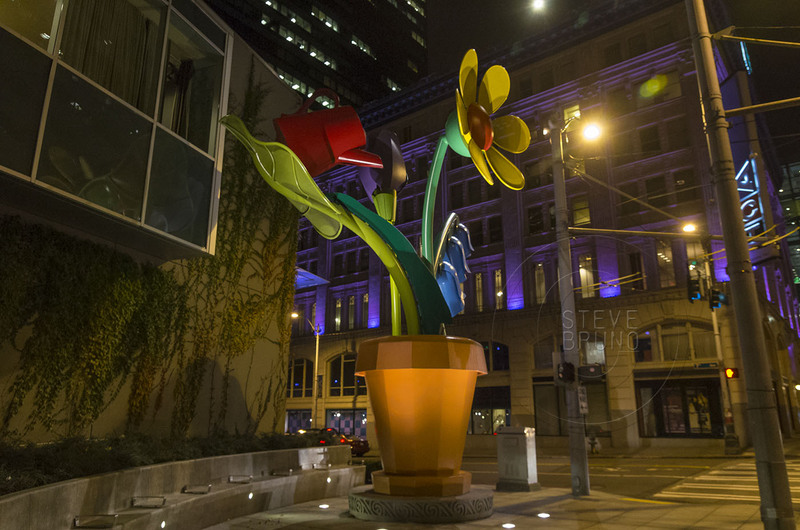 Seattle provides interesting subject matter, and I always find myself venturing the streets, sometimes into the evening. On one of my trips to the Jet City, I came across this oversized flowerpot. The lighting on the building across the street completed the spectrum for my rainbow in the dark. It seemed too easy to post a rainbow shot for this challenge, but if you must see one of my favorite rainbows, check out my previous addition to my blog, Calgary, Revisited.